Prophecy is cherished by many as one of the fivefold ministry gifts described in Ephesians 4:11 and foundational to the life of the church. Yet prophetically gifted people have a reputation of being different and difficult to live and work with. 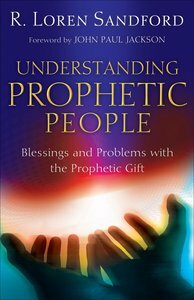 Understanding Prophetic People, written by a prophetic pastor who grew up as the son of a prophetic pastor and leader, helps readers better understand, relate to, and even minister to prophetically gifted people. R. Loren Sandford answers fascinating questions such as, What is it like to grow up as a prophetically gifted person? What is the difference between adrenaline and anointing? Who validates authentic prophetic ministry? How does a pastor rightly relate to a prophet? This rich resource seeks deeper understanding and wisdom on issues of foundational importance for prophetic people and everyone who loves God's gifts. R. Loren Sandford (M.Div., Fuller Theological Seminary) is senior pastor of New Song Fellowship in Denver, Colorado. He speaks internationally and is a past director of Elijah House, an international ministry of counseling founded by his parents, John and Paula Sandford. An author who has released ten CDs of original music, Loren and his wife, Beth, have three grown children and six grandchildren and live in Colorado. Customer Reviews For "Understanding Prophetic People"
The Prophetic is a hot topic. If you are prophetic you don't claim it, but rather are acclaimed by others...but on the way to acclaimation, Sandford explains what life can be like for the person learning to walk in the prophetic. I've heard ppl who aren't particularly gifted in the prophetic , after reading this book say, " but these things apply to every ministry." I've also heard ppl who would like to be prophets as part of an immature need for self aggrandizement lap this book up..
On the whole it is a helpful book debunking spirro chasers and cults and bringing prophets, as all other gifts given to the church, squarely under authority. I found it very helpful , scripturally sound, well written and to the point. I thank God for Loren Sandford who has explained articulately the wilderness experience and the night of the soul experience. For those of us who have been through these experiences we can breathe a sigh of relief. This book is essential reading for Pastors and/or Prophets. Loren also outlines his experiences in dealing with the prophetic as the Pastor/Prophet of a church and the pitfalls we can avoid. His integrity, honesty and transparency is refreshing and encouraging. I am extremely grateful for this book.